Welcome to the website of the Dolvin Elementary School's Parent Teacher Association. We are proud of the many wonderful programs that enrich our school thanks to the strong support of our parents and teachers. Explore our site to find out why it's great to be a Dolvin dolphin! If you are new to Dolvin, be sure to register on MySchoolAnywhere, ﻿enter code: Dolvin to receive email communication﻿s about exciting opportunities and events sponsored by the PTA. LINK to FFN Silent Auction...Coming Soon! The Spring BUY ONE GET ONE BOOK FAIR is coming to Dolvin on May 6-10. Take advantage of these great prices and stock your home library with new books to encourage summertime reading. 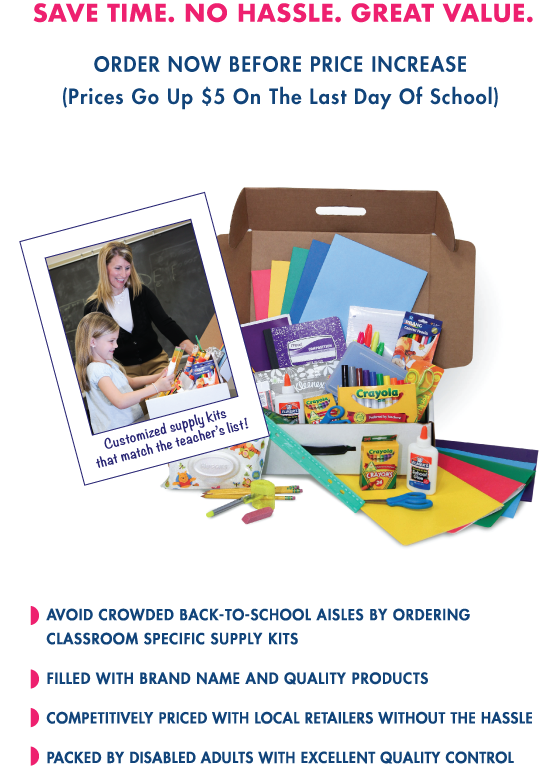 School Supply Kits will be mailed to your home prior to meeting your child's teacher in August! You might start to notice an increased police presence at Dolvin. Not to worry. The Dolvin PTA has invited uniformed Johns Creek Police to visit Dolvin for a free meal in the cafeteria. This initiative expresses our appreciation to the Johns Creek Police for their service and fosters a positive relationship between the children and the police officers. It will also make our school safer in a number of ways. Marked police vehicles in the parking lot act as a deterrent. Police presence on campus means faster response times. Familiarity with the layout of the school will make the police better able to respond to an emergency situation. It is a cost-effective and positive way to help make Dolvin as safe as it can be. So stop by and say “hello” when you see officers eating lunch in the cafeteria. The Dolvin directory is available online only thru MySchoolAnywhere. Don't have a user ID and Password? You first need to register and confirm your data. Input and validate your personal information that will be published in the school directory. Dolvin PTA is on Facebook and Twitter! Stay up to date with all that is going on at Dolvin!